First up – what a killer show. Every now and then you see a show of paintings and you think, this medium just never dies. And nor should it. 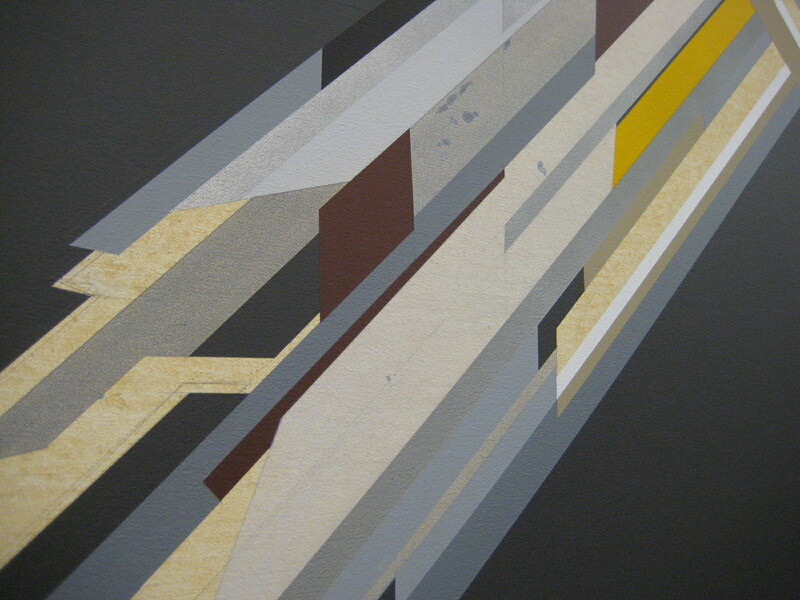 With protagonists like Justin Andrews in the cockpit of his sci-fi x-wing fighter, cutting up fragments of opaque parallelograms across the great canvas of our collective consciousness with his laser guided precision tactics, it’ll always find its place at even the sharpest point of cutting-edge contemporary art. Andrews’ show is titled ‘Systems’ and there’s plenty of entry points to come at the work evoked by that reference. At the core of it, this series of five paintings (and one photographic print) is just an impressive body of paintings that pushes buttons. 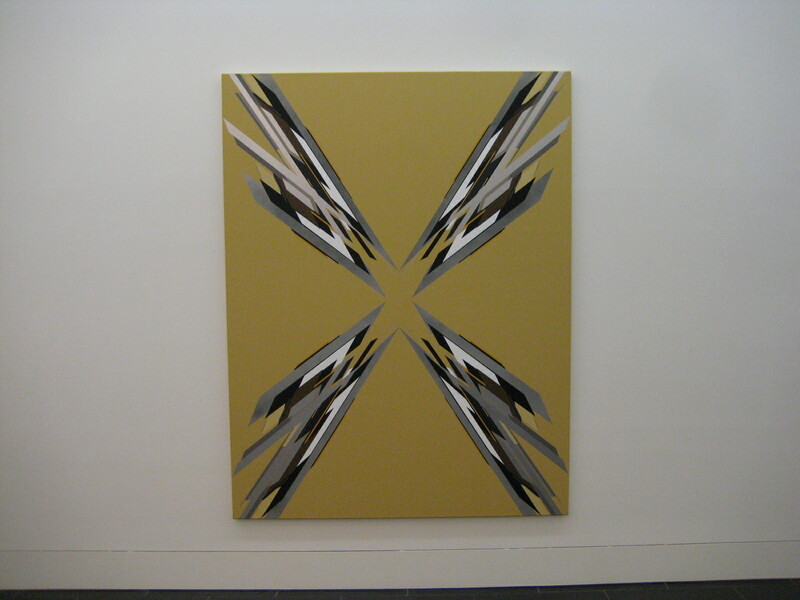 Large scale canvases contain strikingly bold graphic shapes in reflective mirror patterns of equal quadrants. Symmetrical and clean, the dynamic force of the patterns pushes as much outwardly toward the corner of the frame as it pulls inwardly toward an implied gravitational vortex in the centre. Amplified directional perspective, slight disorientation of planar overlays, like axiomatic engineering or architectural draftsman plans, pushed together into dislocated and jostled groupings that defy the implied cartesian grid and induce a slightly affective physical queasiness – in a good way! 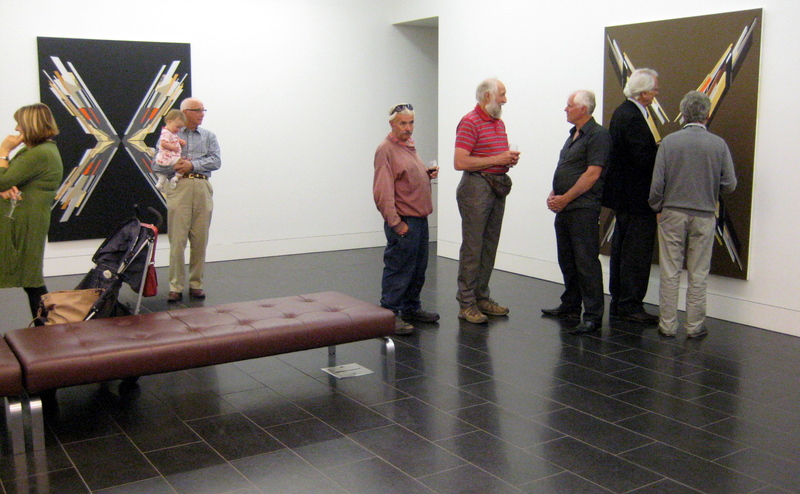 Now, rather than laboriously describe the works, I think I’ll just jump right in and convey the synaptic cross-firings that were triggered in my mind as I stood in the room and had the paintings shudder and shape shift around me. Because that was the compelling thing about this show. It was a catalytic contagion that sent my thoughts racing and took me to all sorts of wonderful places. Apparently a very notable thing about the prop design of Star Wars was the way in which George Lucas had all the spaceships made so that they had scuff marks, dirt and broken bits on them. Previously, people always represented the advances of technology with perfect precision, total cleanliness and no sign of entropy or decay. But in reality, everything wears the trace marks of its existence on it somewhere. 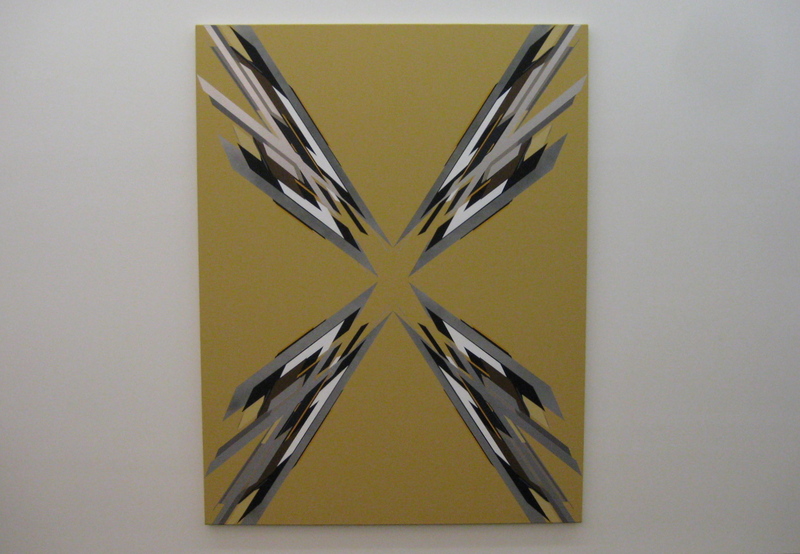 Standing back from Andrews’ paintings brings to mind ideas of computer generated graphics, vector animations and laser cut machine neatness. Get up a bit closer and there’s pencil marks, imperfectly layered paint and bleed marks from the tape lines. With all the symmetrical and reflected purposefulness of the composition, at the heart of the works is the hand of an organic animal. This slippage between crispness and imperfection is so beautifully balanced that it’s almost impossible to find the sweet spot at which they converge or crossover. But the feeling of the sweet spot is there, and it’s a wonderous thing. The way the paintings are quarter sections, reflected and mirrored into a cross pattern, brought to mind some stone work I had seen in a chapel in Padua, Italy. Great slabs of red marble had been cut and opened up, like pages of a book. Then cut and opened again to create a pattern of four practically equal quadrant parts. The veins in the marble were reflected in each quadrant and at a distance looked perfectly exact. But at closer inspection, the organic irregularities revealed slight variations in each section. This rock, once a heated molten fluid was a chaotic force working its way through the earth until it cooled into its captured pattern of variant colour. Then, at some rather minutely infinitesimal moment in its life, it was hacked open by a cerebrally advanced and mostly hairless ape (and here I’m just emphasising the animal that is the human, not passing judgement on medieval stone masons!) to reveal its inner captured moment. I’m sure this comes to mind because when I’m looking at Andrews’ paintings all I can imagine is that from the vast chaotic flux of constant and clattering motion of forms and shapes, these images have been nailed down into one frozen moment. An exquisitely timed snapshot of strobing blocks of colour. Really, I could go on even more about these works (the systematic process of creation from sculpture to photography to digital collage to drawing to painting, deserves more than this passing mention, for example) but if you get the chance you should check them out in the flesh. Digital representations are not going to give you the full truth of the work because they will flatten the minute tonal variations in some of the colours, hide the paint bleeds and make the subtle pencil marks practically invisible. Standing in front of a painting that is bigger than you, is part of the reason why the blocks of colours, why the rhomboidal planes, shudder back and forth as they stretch across your focal point and into your periphery vision. And really, this cannot be understated – this impact that comes with presence. The show runs at the La Trobe University Visual Arts Centre until 27 November and Andrews is giving a floor talk on Saturday 22 October. Tags: Justin Andrews, La Trobe VAC, review. Bookmark the permalink.